Jordana Moerbe moved to Austin from El Paso, Texas in 2002. She worked as an operations manger for Cendant Car Rental group for several years before realizing that she was meant to take her life in a more passionate direction. 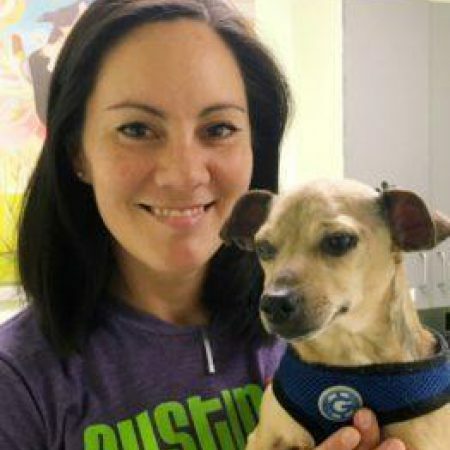 She had always loved animals but had never worked in animal welfare, so she jumped at the chance to work at a low cost spay/neuter clinic, Emancipet, when a friend recommended she apply for an open position. She was hired and fell in love with animal advocacy work. In 2009, she was offered a tech position with APA!, where she worked directly under Dr. Ellen Jefferson and helped build what is now the APA! Medical Clinic. Today, the medical clinic has the capacity to treat upwards of 100+ medical cases at any given time as well as support the Parvo Puppy ICU, neonatal ICU, feline leukemia ward, and the ringworm ward.